Based on the novel series by Junpei Gomikawa, The Human Condition is a film trilogy that explores the life of a young man with socialist and pacifist views of the world who endures oppression and terror during the era of World War II Japan. Directed by Masaki Kobayashi and screenplay by Kobayahi and Zenzo Matsuyama, the film is set into three parts that plays into the journey of a young man who goes from labor camp supervisor to serving as part of the Imperial army in World War II and becoming a POW for the Soviet Union as he questions the journey of his life. Starring Tatsuya Nakadai, Michiyo Aratama, Iseko Ariama, Chikage Awashima, Keiji Sada, Taketoshi Naito, Minoru Chiaki, Yusuke Kawazu, Tamao Nakamura, Chishu Ryu, and Hideko Takamine. The Human Condition is an astonishing and tremendous study of humanity in the era of war from Masaki Kobayashi. The film is a three-part story told in the span of nearly three years from 1943 Japan to early 1946 as a man named Kaji (Tatsuya Nakadai) would endure a series of events and moments that would shape his view of humanity as he tries to hold on to his views of socialism and pacifism thinking that there’s some good in the world of war. Since it is a three-part movie with a total running time of 574-minutes (nine-hours and forty-seven minutes without intermission), it is a film that plays into Kaji’s view on the world from trying to change things and then be pushed to the edge over how the world works. In the first film, he starts out serving as labor camp supervisor in Japanese-occupied Manchuria in China where he is challenged by corrupt men who want to punish and rule over the Chinese. Due to his actions in trying to maintain some peace and civility, he would be punished into becoming a soldier in the second film where he endures brutality in his training and later tension with soldiers as he tries to train older recruits. The third film would have Kaji trying to survive once his platoon has been overwhelmed where he is eventually captured by Soviet forces as he contends with everything he endures and encounters. The screenplays by Masaki Kobayashi and Zenzo Matsuyama explore not just Kaji’s evolution as a man trying to find some kind of hope and humanity during a horrific period of war. In the first film, Kaji starts out as a man of great intelligence as he is exempted from military service where he would take a job in Manchuria as a labor camp supervisor where he brings his new bride Michiko (Michiyo Aratama) as she tries to understand the work that Kaji is trying to do in his work where he has to deal with corrupt officials despite the support of a camp officer in Okishima (So Yamamura) and a young Chinese officer in Chen (Akira Ishihama). While he tries to appease prisoners including a few troublesome Chinese prisoners like Kao (Shinji Nanbara) as well as offering prostitutes to ease their troubles. Things don’t go right because of the way the Japanese wants to control things and to ensure the increase production in ore as trouble would ensue where Kaji’s actions into helping the Chinese and ensure that they’re treated humanly would lead to his path in the second film. By being forced to serve in the military as punishment where there are those watching over him, Kaji would survive training though he longs to be with his wife. Yet, some of the tactics of veteran soldiers and such would create trouble and tragedy where Kaji tries to make things right as his actions would get the attention of his old friend Kageyama (Keiji Sada) who would have Kaji train older recruits during the final moments of war. Yet, his attempts to make things easier and deal with things behind the scenes only trouble him as Soviet forces would arrive. The third film would be about Kaji’s attempt to survive with the few allies he has left as he would encounter a group of lost refugees, soldiers without leaders, and eventual capture by the Soviets. All of which leads to him trying to comprehend the idea of war and what it means to live. It’s not just the development of Kaji that is important but also in the environment and people he encounter in his journey from being this idealist pacifist with socialist views on the world to a soldier who saw a world that is very troubled and dark in the days of war. In some ways, it is an anti-war film that is being told but one that plays into a man trying to hold into the idea that there is good in the world of war as he ponders if the enemy are just as humane as he is. While there are those who are baffled by his idealism and determination, they would admire him for sticking to his beliefs as he would be tested. Even in moments where Kaji would be forced to see people who are good be harmed either by their own selfishness or by some event as it add to Kaji questioning his own ideals as his capture by the Soviet would only create more confusion from within. Kobayashi’s direction is nothing short of grand in terms of its visuals as well as the length to tell the story with such ambition. 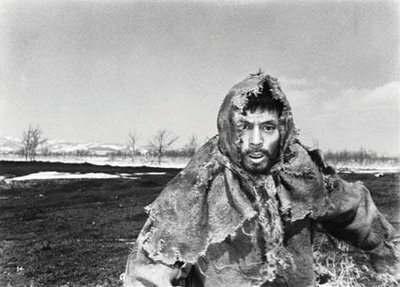 For the first film entitled No Greater Love and its subsequent films, Kobayashi does maintain compositions and images that do play into Kaji’s struggle with the world that often include slanted camera angles as if Kaji is either walking up or down a hill or a mountain. Shot on location in northern Japan (due to strained Chinese-Japanese relations at the time), Kobayashi’s usage of mountains and barren landscapes play into the world of the labor camps where the Chinese are imprisoned along with these intricate usage of tracking shots that would become a prominent factor for much of trilogy. Notably for scenes in the second film Road to Eternity where Kobayashi would use these intricate tracking shots to play into the sense of tension that emerges in the training camps and at the barracks where soldiers sleep as it makes things uneasy. The direction also Kobayashi maintain a sense of intimacy through his usage of close-ups and medium shots for scenes at the camp and brothels in No Greater Love and at the camps in Road to Eternity. Much of it would play into not just Kaji’s sense of longing but also his struggle to hold on to his beliefs and the semblance of humanity around him. The close-ups wouldn’t just play into Kaji’s own state of mind but also in the characters who would become attached to him as the final days of the war is emerging. In the second half of Road to Eternity where Kaji and his platoon would have to battle it out with the Soviets. It does become a very different film where Kaji is in the middle of a battlefield knowing that he might die but manages to survive but its aftermath would play into a growing sense of disillusionment. It then leads to the third and final film of the trilogy in A Soldier’s Prayer where Kaji and a few soldiers he had befriend are fighting to survive where they would encounter refugees and others on their way back to Manchuria. The third film does become much broader in terms of its visuals and in its suspense as well as the sense of drama where Kaji is trying to maintain some dignity despite the fact that he knows that Japan has been defeated. Kaji’s encounter with different types of refugees would play into his own resolve where Kobayashi’s direction is quite vast in its compositions that include some very wide shots of the farmland where Chinese militia farmers are taking watch. By the time the film moves into the Soviet camps, it does become more grim where Kaji would endure labor work as punishment but also a sense of disillusionment in the way he sees the Soviet as who they really are from their view of socialism. It’s in these moments where Kobayashi would definitely heighten the tension and drama for an ending where Kaji and everything he had encountered would force him to make a decision for what is right in the world. Overall, Kobayashi creates what is truly an astronomical and gripping trilogy of films about a humanist dealing with war and inhumanity during one of the most horrific periods in world history. Cinematographer Yoshio Miyajima does brilliant work with the black-and-white cinematography for all three films where he infuses a lot of unique images and lighting schemes with Takaskhi Kato providing some harsh lights for a rainy scene in the first film while Akira Aomatsu does some of the lights for scenes at night and in the interiors for the second and third film as well as some naturalistic images for the latter for scenes set in the woods as the photography is among one of the film‘s highlights. Editor Keiichi Uraoka does amazing work with the editing in not just creating rhythmic cuts for some of the dramatic and active moments in the film but also some dissolves and stylish cuts to play into the drama including the usage of flashbacks and freeze-frames for the third film. Production designer Kazue Hirakata, with set designers Yoji Maru (for the first film) and Takamasi Kobayashi (for the second and third films) and set decorators Kyoji Sasaki (for the first film) and Seiji Ishikawa (for the second and third films), does fantastic work with the set design from the look of the Manchurian villages where Kaji and Michiko would live to the labor camps, training camps, and other places that Kaji would encounter throughout his journey. Sound recorder Hideo Nishizaki does excellent work with the sound to capture the atmosphere of the labor camps and ore mines in the first film as well as the scenes set in the training camps, battlefields, and at the Soviet prison to play into the world that Kaji is at. The film’s music by Chuji Kinoshita is great as it features an array of compositions from somber string arrangements to play into the drama to bombastic orchestral numbers that add to the tone of war as well as cadence drum arrangements to play into that world of the military. The casting for all three films are incredible as it is a large yet well-crafted ensemble in the many roles that were assembled for the film. From No Greater Love, there’s notable small roles from Nobuo Nakamura as labor camp manager, Akitake Kono as a camp captain, Eitaro Ozawa as a brutish camp official in Okazaki, Masao Mishima as the camp manager Kuroki, Seiji Mizoguchi as the prisoner Wang Heng Li, Shinji Nanbara as the prisoner Kao, Koji Mitsui as the abusive camp officer Furya, Ineko Arima as the prostitute Yang Chun Lan who falls for Kao, Akira Ishihama as the Chinese officer Chen, So Yamamura as the sympathetic officer Okimshima, and Chikage Awashima as the brothel madam Jin Tung Fu whom Chen would fall for. From Road to Eternity, there’s small roles from Kokini Katsura and Jun Tatara as a couple of first-class privates, Michio Minami as the abusive private first-class Yoshida, Fumio Watanabe and Shoji Yasui as a couple of officers at the camp, and Susumu Fujita as an older recruit Kaji is training. From A Soldier’s Prayer, there’s noteworthy small roles from Tamao Nakamura as a refugee Kaji and his fellow soldiers encounter, Ed Keene and Ronald Self as a couple of Soviet officers, Koji Kiyoumura and Keijiro Morozumi as a couple of soldiers, Kyoko Kishida as a prostitute refugee that Koji meets, Reiko Hitomi as a young woman who joins the soldiers on a journey, Hideko Takamine as a woman in a refugee camp, and Chishu Ryu as an old man in the refugee camp. From the second film, Kei Sato is terrific as the veteran recruit Shinjo who would make a drastic attempt to escape the military while Kunie Tanaka is superb as the poor-sighted and cowardly Obara who would endure horrific abuse in the hands of supervisors. Keiji Sada is excellent as Kaji’s old friend Kageyama who appears in the first and second film where he becomes a lieutenant in the latter who would appoint Kaji to train a group of older officers. Taketoshi Naito and Yusuke Kawazu are brilliant in their respective roles as the soldiers Tange and Terada who both admire Kaji for his determination with the former being the cynic and the latter being a young man. Nobuo Kaneko is fantastic as the corrupt officer Kirihara who would also be captured by the Soviets where he is able to sway things in their favor much to Kaji’s disgust. Michiyo Aratama is amazing as Kaji’s wife Michiyo who copes with her husband’s activities and his absences as she would visit him during his training as a soldier while becoming an object of determination in the third film where she would appear as an apparition of other women to remind him what he needs to return to. Finally, there’s Tatsuya Nakadai in a performance for the ages as Kaji as an idealistic young man who would endure some of the most horrific events in history. It’s a performance where Nakadai maintains a sense of humility and drive into his performance where he starts off as determined to make a difference in a world that is very cruel only to be pushed and pushed to face the harsher side of reality. Even as he contends with some of the actions he had caused and his attempts to do good during the time of war as it is a very haunting yet exhilarating performance from Nakadai. The 2009 four-disc Region 1 DVD set from the Criterion Collection presents the films in their 2:35:1 theatrical aspect ratio on an enhanced 16x9 widescreen format with 1.0 Dolby Digital Mono sound as both sound and image are remastered for this release. Three discs contain the three different films in the trilogy as well as a fourth disc of special features. The first is a fourteen-minute excerpt of a rare 1993 interview with Masaki Kobayashi by filmmaker Masahiro Shinoda made for the Japanese Director’s Guild. Kobayashi talks about his collaboration with cinematographer Yoshio Miyajima and their methods as well as aspects on the production along with the first film’s initial reception, despite winning an award at the Venice Film Festival, where it wasn’t well-received. The 18-minute interview Tatsuya Nakadai has the actor talking about the film and his performance where he was just a newcomer who had worked with Kobayashi prior to making the trilogy. Nakadai also talks about the production as it was a tough one that spanned over three years as only he and Kobayashi were the only ones that didn’t get sick throughout the production. Nakadai also talks about how some of his performance was based on Kobayashi’s own experience as a POW which he added into the film as well as talking about seeing the film over the years which he is proud of as he also thinks it’s one of the finest anti-war films ever made. The 25-minute appreciation video about the film and Kobayashi by filmmaker Masahiro Shinoda has the filmmaker discussing a lot of the film’s themes and how it would relate to the films Kobayashi would make throughout his career. Shinoda also talks about Kobayashi’s life as a POW which would reflect on some of the scenes shown on the film where Kobayashi wanted a realistic depiction of what it was like. Shinoda also talks about the novelist of the stories who, like Kobayashi, was also part of the military that refused to serve as an officer where the two both shared their own experiences of war which would play into the film. Shinoda also talks about the romantic elements in the film that he felt was overlooked as he revealed much of the influence of late 1930s French cinema that had an impact on Kobayashi as a filmmaker. The DVD set includes the trailers for all three films which displays its sense of ambition and importance to the Japanese cinema. The DVD set also includes an essay by film historian Philip Kemp entitled The Prisoner where Kemp talks about Kobayashi’s film career but also the state of Japan during the time the film was made. One of which where Japan was struggling with the actions it caused as well as be in denial about what they did where the film’s release did spark some controversy despite the international acclaim it would receive. Kemp also talks about the film and its narrative along with some of its irony as it concerns Kaji’s socialist views which would add to Kaji’s own downfall and disillusionment. It’s a very compelling essay that serves as a fine accompaniment to a towering trilogy. The Human Condition trilogy is truly an outstanding achievement from Masaki Kobayashi that features a spectacular performance from Tatsuya Nakadai. While each film do stand out on their own, it is far more powerful and exhilarating as one entire piece thanks to a great ensemble cast and amazing technical work. It is also an intriguing study about humanity at a point in time where human kindness and decency are swayed away by something as senseless as war. In the end, The Human Condition trilogy is a magnificent trilogy of films by Masaki Kobayashi. How have I not heard of this? Watching the evolution of this man sounds like an amazing experience. I'll be honest, though, three three-hour movies is a daunting task. Have to block out a free(ish) weekend for this. Hats off to you for such a comprehensive review. Thanks for this. Great review! This sounds very interesting, and very heavy. I'm glad it was worth the long viewing though. I've never heard of this, but I'm sold. @Wendell-You're welcome. Actually, it took me a week to watch it since the film is in six parts as the first one is the longest in nearly 3 and 1/2 hours and the rest are just above 3 hours. That was one of the reasons why I chose this as a Blind Spot. I want to be challenged and more. @Brittani-It was worth it and it is truly an experience in the world of cinema. @Fisti-Do it for next year's Blind Spot. Hi Steven, this looks pretty harrowing but beautiful and ultimately rewarding viewing. But wow, sounds like you have to dedicate quite a bit of time to get through it all. Great review! Agree about the pacifist message and how the events shaped the main characters view of humanity. I heard it was made as a searing criticism of the Japanese role in the Pacific War, getting laborers to work effectively, yet treating them humanely is neglected. Kaji's character is developed out of the authors+directors own experiences as unwilling participants in a brutal and sadistic military environment. The crowd desperate for food is a very powerful scene in part 1. At times, the politics went a bit over my head, but not that vital in terms of following the overall human drama. @ruth-It is. I wanted to do something big like a trilogy or a film series as a Blind Spot so I went with this. I heard a lot about this and I said "I'm going for it". Given that lately I've been taking my time in watching films due to other activities around me. I dedicated a week into watching the three films. It's best to watch the film at your own pace. I hope you see it. @Chris-I saw the special features on the DVD set as I realized how realistic Kobayashi wanted to depict these events and the result made it more powerful. It is a rewarding experience that I think more people should see.